Keep it short and sweet: here's a custom Facebook page that practices the tips below. A call-out to press the “like” button. I love pages that literally have an arrow pointing up to the “Like” button and request that you press the button. How can you expect people to press the button if you don’t actually ask them to? A link to your website. Rather than recreating your site on your Facebook page, simply let visitors know where they can find you on the web. Be sure the link opens in a new tab/window, so they don’t leave your Facebook page without pressing the magic button first! Your business phone number. There’s a chance visitors stumbled upon your Facebook page in an internet search before they found your website. If this is the case, you’ll want to provide a way for them to contact you at this first point of contact to ensure they don’t stray to a competitor’s page out of frustration. A simple statement about what your company does. This could be your company’s tagline, a 3-point bulleted list of the products or services you provide, or a one-sentence description of your company. This helps visitors to know they’re in the right place when they find your page. Images can also provide visual clues as appropriate. Something to remember about the Facebook Welcome page: once a visitor “Likes” your company on Facebook, they will be directed right to your wall the next time they visit. The implication here? Chances are they’ll never see your page again (when’s the last time you clicked on the “welcome” link on the left side of the page once you’ve “Liked” a business?). They will, however see your Facebook badge (the image to the left of your wall) every time they visit; this would be a great place to include your logo, tagline, web address and phone number as well. Ultimately, the Facebook Welcome page is just that: an initial welcome. And that’s OK! 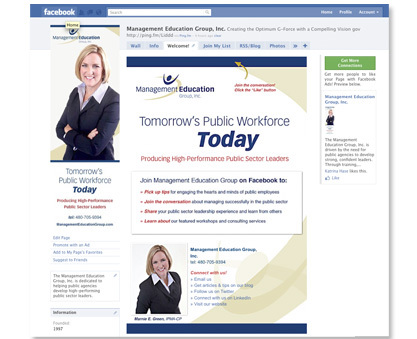 Use your Facebook wall to post links to your website, e-newsletter signup form, blog posts and more. This entry was posted on Friday, August 5th, 2011 at 9:34 am and is filed under Uncategorized. You can follow any responses to this entry through the RSS 2.0 feed. You can leave a response, or trackback from your own site.